Qu Hao is one of the three famous Wu Yi green teas together with Jin Mei and Xue Ya. Mount Wu Yi is renowned for its many Oolong teas, but before any Oolong teas were produced there, it was actually famous for its green teas. Today, only 6% of its total production is green tea while Oolong and Black teas made up the rest at 80% and 14% respectively. Wu Yi Qu Hao is a very special tea that you will not easily find even in the vast tea market in China. The production of this tea is very limited and they are usually fully pre-ordered by a few large tea houses in Beijing, Shanghai and Wu Yi. Qu Hao is a refreshing and light tea with a flowery sweet and lasting aftertaste. There is also a hint of nutty fragrance in the taste. 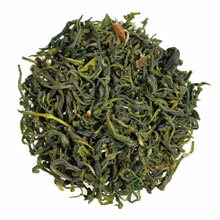 You will be thinking you are drinking Wu Yi Oolong tea with this one. It is also easy to brew and will not go bitter easily. Downy white tender buds with 1 to 2 leaves each. The tea leaves are curled and dark green in color.